OXFORD, Miss. 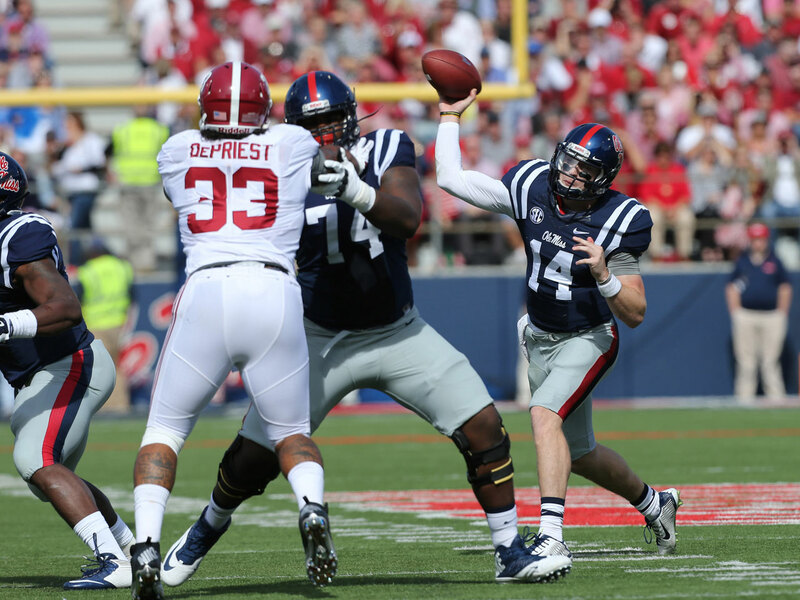 - Bo Wallace threw for 251 yards and three touchdowns, including two in the fourth quarter, and No. 11 Mississippi rallied from a fourth-quarter deficit to stun No. 3 Alabama 23-17 on Saturday. Ole Miss (5-0, 2-0 Southeastern Conference) has won five games to start the season for the first time since 1962 and ended a 10-game losing streak against the Tide. The Rebels trailed 17-10 midway through the fourth quarter, but pulled even on Wallace's 34-yard touchdown pass to Vince Sanders with 5:29 remaining. On the ensuing kickoff, Alabama's Christion Jones fumbled and Ole Miss recovered, giving the Rebels great field position at the Alabama 31. Ole Miss took a 23-17 lead on Wallace's 10-yard touchdown throw to Jaylen Walton with 2:54 remaining. Alabama (4-1, 1-1) had a chance to win, but Senquez Golson intercepted a pass from Blake Sims in the end zone with 37 seconds remaining. FORT WORTH, Texas - Paul Dawson returned an interception 41 yards for a touchdown, TCU made a huge fourth-and-1 stop with just over 3 minutes left and the Horned Frogs remained undefeated. Oklahoma (4-1, 1-1 Big 12) had the ball after the two teams had three turnovers in a span of four plays - another interception by Trevor Knight between two fumbles by TCU. On fourth down from the TCU 22, Samaje Perine was stuffed by linebacker Marcus Mallett for no gain. Officials confirmed on a replay review that Perine, who had three TD runs in the game, was stopped short of a first down. Dawson's big pick for TCU (4-0, 1-0 Big 12) came with 14:12 left. He reached up with both hands to grab the ball and raced untouched for a score to make it 37-31. STARKVILLE, Miss. - Dak Prescott threw two touchdown passes, added three Tebow-style TD runs, and Mississippi State overwhelmed Texas A&M. The Bulldogs (5-0, 2-0 Southeastern Conference) jumped out to a 28-7 lead in the first half and never let Kenny Hill and the high-scoring Aggies (5-1, 2-1) get close enough to threaten. Hill threw for 365 yards and four touchdowns, but had three passes picked off by linebacker Richie Brown, who matched a school record. Prescott first plowed into the end zone for two short TDs and sealed it with an 11-yard quarterback draw that made it 48-17 in the fourth quarter. The junior was 19 for 25 for 264 yards and ran for 77 yards. The Bulldogs showed beating LSU for the first time in 15 years a couple weeks ago was no fluke. They dominated A&M in almost every way. Josh Robinson ran for 107 yards and two scores and linebacker Benardrick McKinney helped harass Hill. PASADENA, Calif. - Andy Phillips kicked a 29-yard field goal with 34 seconds left for Utah, and UCLA's Ka'imi Fairbairn missed two field-goal attempts with no time on the clock. Utah (4-1, 1-1 Pac-12) drove 63 yards in 10 plays for the go-ahead kick, taking 4:16 off the clock behind the rushing of Kendal Thompson and Devontae Booker to set up Phillips' kick. Brett Hundley drove the Bruins (4-1, 1-1) to the Utah 37, but Fairbairn missed a 50-yard field goal on an untimed down after Eric Rowe was penalized for running into Fairbairn on a failed 55-yard attempt as time expired. Hundley passed for 269 yards and two touchdowns. TALLAHASSEE, Fla. - A lackluster effort from quarterback Jameis Winston and the Florida State offense allowed kicker Roberto Aguayo and the defense to star against Wake Forest. Winston threw for 297 yards with a touchdown and an interception, and Aguayo kicked a career-high five field goals. The reigning Lou Groza Award winner also set a school record with 21 consecutive field goals. The Seminoles (5-0, 3-0) dominated the overmatched Demon Deacons (2-4, 0-2) and held them to 126 offensive yards, including 40 rushing. Linebacker Reggie Northrup forced and recovered a fumble and ran it 31 yards for a touchdown that put Florida State up 30-3 in the third quarter. Wake Forest quarterback John Wolford was held to 58 yards passing and an interception. AUBURN, Ala. - Nick Marshall passed for 207 yards and two touchdowns and ran for 119 and two more scores to lead Auburn past LSU. Auburn (5-0, 2-0 Southeastern Conference) dominated from the start, with the 41 points matching its highest total in the rivalry. LSU (4-2, 0-2), which turned to freshman quarterback Brandon Harris, has dropped its first two SEC games for the first time in coach Les Miles' decade-long tenure. Harris completed 3 of 14 passes for 58 yards before getting replaced late in the third quarter by Anthony Jennings. Marshall completed 14 of 22 passes, had 16 carries and supplied a steady diet of big plays. Marshall threw touchdown passes of 56 yards to Sammie Coates and 9 yards to tight end C.J. Uzomah, and scored on runs of 7 and 29 yards. Cameron Artis-Payne ran 24 times for 126 yards and gained 35 yards on three catches. Coates had his first big game of the season with 144 on four catches after coming in with 56 receiving yards. AUSTIN, Texas - Shock Linwood ran for 148 yards and the clinching touchdown and Baylor overcame a rare off day by quarterback Bryce Petty and the nation's No. 1 offense. With Petty misfiring, the Bears (5-0, 2-0 Big 12) won with tough defense, two big plays on special teams and a power running game that wore down Texas (2-3, 1-1) in the second half. Terrell Burt scored Baylor's first touchdown with a 62-yard return after a blocked field goal in the first quarter. A fake punt in the third set up Petty's touchdown pass to Antwan Goodley. Linwood put it away with a short touchdown run in the fourth. Texas held Baylor to 390 total yards, but only narrowly avoided its first shutout at home since 1976. SOUTH BEND, Ind. - Everett Golson threw a 23-yard touchdown pass to Ben Koyack in the corner of the end zone with 1:01 left and Notre Dame overcame two turnovers and two bungled snaps on field goals to beat Stanford in cold and rainy conditions. Koyack caught the pass as he fell out of bounds and safety Jordan Richards dove to try to break it up on Notre Dame's last chance on fourth-and-11. The Fighting Irish improved to 5-0 for the third time since Lou Holtz left in 1996. The Cardinal (3-2) have two losses this early in the season for the first time since 2008. Golson also threw a 17-yard touchdown pass and Notre Dame amassed 370 yards of total offense against the nation's top defense. EAST LANSING, Mich. - Trae Waynes intercepted Tommy Armstrong's pass with 30 seconds remaining, and No. 10 Michigan State held off a furious Nebraska rally. The Spartans (4-1, 1-0 Big Ten) led 27-3 heading into the fourth quarter before three Nebraska touchdowns set up a tense finish. A 43-yard pass to Alonzo Moore gave the Huskers the ball at the Michigan State 37 with just under a minute to play. Nebraska (5-1, 1-1) couldn't finish off the comeback. Armstrong's pass to the end zone fell incomplete, and Waynes then came up with his second interception of the game. The Spartans shut down Nebraska's vaunted running game, and the Cornhuskers didn't score in the first half despite three Michigan State turnovers in its own territory. Tony Lippett caught a 55-yard touchdown pass from Connor Cook in the first quarter, and when he scored on a 32-yard reverse, Michigan State was up 27-3 with 2:02 remaining in the third. Nebraska's Ameer Abdullah, who was held to 45 yards rushing, scored on two short runs in the fourth, and De'Mornay Pierson-El returned a punt 62 yards to make it 27-22 with 3:22 remaining. It might have been closer, but Nebraska attempted a pair of 2-point conversions in the fourth and missed them both. ATHENS, Ga. - Hutson Mason threw two touchdown passes to Chris Conley, Todd Gurley ran for 163 yards with two scores and Georgia beat Vanderbilt. Georgia (4-1, 2-1 Southeastern Conference) used Gurley's scoring runs of 4 and 14 yards and Mason's first touchdown pass to Conley to take a 21-0 lead in the first quarter. Gurley's first touchdown run, a 5-yarder, was out of the wildcat formation. He added a 14-yarder later in the opening quarter for a 14-0 lead over overmatched Vanderbilt (1-4, 0-4). LOS ANGELES - Jaelen Strong caught a 46-yard touchdown pass from Mike Bercovici as time expired, and Arizona State scored three TDs in the final 3:53 to shock Southern California. Bercovici capped his 510-yard passing performance with his third TD pass to Strong, who slipped in front of USC's Hayes Pullard at the goal line and pulled in the Hail Mary throw. Arizona State's bench stormed the field to celebrate the first win at the Coliseum since 1999 for the Sun Devils (4-1, 2-1 Pac-12). Cody Kessler passed for 273 yards for the Trojans (3-2, 2-1), who led 34-25 with 3 minutes to play. USC recovered two onside kicks and got a 53-yard TD run by Buck Allen in the final minutes, but the Trojans' pass defense still couldn't stop Bercovici in his second start. EVANSTON, Ill. - Godwin Igwebuike had three interceptions and Justin Jackson ran for 162 yards, helping Northwestern upset Melvin Gordon and Wisconsin. Trevor Siemian threw for a touchdown and also had a key block on Miles Shuler's 16-yard TD run as Northwestern (3-2, 2-0 Big Ten) earned its third consecutive win. The Wildcats also had a nice day on special teams, with Jack Mitchell kicking two short field goals and punter Chris Gradone handing over poor field position to the Badgers for much of the afternoon. Gordon had 27 carries for a career-high 259 yards and a touchdown for Wisconsin (3-2, 0-1), but Tanner McEvoy and Joel Stave combined for just 138 yards passing on a cold, damp afternoon. It was Stave's first appearance of the season after the 19-game starter struggled mentally with throwing issues. COLLLEGE PARK, Md. - J.T. Barrett completed 18 of 23 passes for 267 yards and four touchdowns and ran 16 times for 71 yards and a score for Ohio State in Maryland's Big Ten home debut. Ezekiel Elliott rushed for 139 yards on 24 carries, and the defense had four interceptions to hush the first sellout crowd at College Park in nearly six years. The Buckeyes (4-1, 1-0) piled up 533 yards. Brad Craddock kicked a school-record 57-yard field goal for the Terrapins (4-2, 1-1). STILLWATER, Okla. - Desmond Roland ran for 95 yards and two touchdowns and Tyreek Hill returned a kickoff 97 yards for a touchdown for Oklahoma State. Brandon Sheperd caught a career-high eight passes for 91 yards and Jhajuan Seales added four catches for 75 yards and a score for the Cowboys (4-1, 2-0 Big 12). Hill had 148 yards in kickoff returns and 46 yards in punt returns. Daxx Garman passed for 271 yards and a touchdown. Iowa State (1-4, 0-3) was held to 322 total yards. GREENVILLE, N.C. - Shane Carden threw for 410 yards and four touchdowns to help East Carolina beat SMU in its American Athletic Conference debut. Justin Hardy had three first-half touchdown catches for the Pirates (4-1), who were playing with a national ranking for the first time in six years. Carden became the program's career passing leader midway through the third quarter while ECU finished with 581 yards. SMU (0-5, 0-1) had a season-high 390 yards. MANHATTAN, Kan. - Jake Waters threw for 290 yards and four touchdowns, ran for 105 yards and another score and led Kansas State past penalty-prone Texas Tech. Tyler Lockett had 12 catches for 125 yards and two scores, and Curry Sexton had nine catches for 128 yards and the other two scores, helping the Wildcats (4-1, 2-0 Big 12) prepare for a showdown in two weeks with fourth-ranked Oklahoma by easily dispatching the Red Raiders. Playing with a sore shoulder, Davis Webb threw for 247 yards and two touchdowns for Texas Tech (2-3, 0-2). But he also threw a career-high four interceptions - two each to Travis Green and Morgan Burns - and was victimized by numerous drops that ruined promising drives.